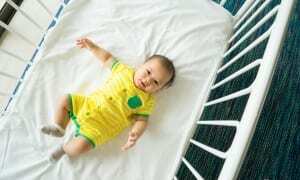 Find out what baby bedding (from everything out there) you actually need to keep your baby snug and safe in his or her cot bed. There are countless pieces of baby bedding available to buy – but you don’t actually need that much to keep your baby comfortable when sleeping. Although you might want to stockpile a small stash of the basics ready to hand for when mishaps happen. You'll more than likely get blankets as presents, but it's always useful to have a few extra. 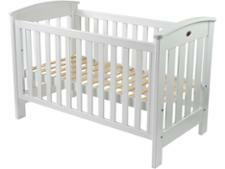 Cot bed reviews – find the safest and most durable cot bed for your little one. These are very useful, especially as your baby gets older and moves around in the cot more. A fitted sheet won’t ruffle and come away from the mattress as a result of a squirming baby. 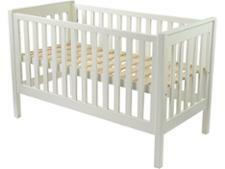 However, they can be tricky to fit if the cot mattress you've bought is quite stiff and heavy. Fitted sheets tend to be made of cotton jersey or terry (fine towelling cotton/polyester mix), which won't require ironing. These tend to be used as a top sheet in combination with a blanket. They're fine for use as a bottom sheet too, but are generally more awkward to put on than fitted sheets. Flat sheets tend to be made either from flannelette or plain cotton. Plain cotton has the advantage that it can be washed at higher temperatures, although it doesn’t feel as soft as flannelette. Read our safe sleeping tips for advice on how you should arrange blankets in your baby's cot. The cellular structure of these 100% cotton blankets mean they're warm in winter and cool in summer. They're also lightweight, and are washable at higher temperatures than fleece or acrylic. These are extra-lightweight and quick drying, with the same year-round usefulness as the cotton cellular type. They're similar in price to cotton cellular blankets, but tend not to be as soft on the skin as cotton or fleece. A coverlet or comforter is a lightweight baby bedding version of a quilt that can safely be used for babies under one year old because it doesn't have the soft padding of a standard quilt. It's as warm as a sheet and blanket combined. Always follow the manufacturer's instructions before using a coverlet, as some aren't suitable for babies under 3.5kg or 7lb 12oz. These are basically mini sheepskin rugs. 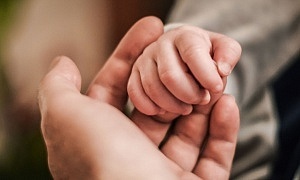 They're designed to be soft and comforting for babies to lie on, and many parents feel they calm and soothe newborns. If you buy one, make sure it's specifically for baby use. 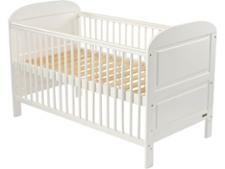 Pair up your choice of baby blankets with a top-scoring Best Buy cot bed. Not a Which? member? Sign up for a £1 Which? trial to instantly access these and thousands of our other independent reviews. Quilts, duvets and pillows shouldn't be used for babies under one year old. After this, it's fine to replace baby blankets and top sheets with a cot quilt or duvet if you wish. Pillows can also be safely used from the age of one year, but don’t feel you have to buy one – your baby will be used to sleeping without one and may even not want it in the cot. These sleeping bags designed for babies and young children usually have a full-length front zip or poppers at the shoulders and sometimes a zip at the side with sleeveless arm holes. Rather than tucking your baby up at night under sheets and blankets, you simply zip or popper them into the bag. According to The Lullaby Trust, sleep bags should be cotton, lightweight and not have a hood. Make sure the sleep bag is not too big around the neck, to prevent your baby from slipping down into the bag. There are no covers to throw off, so your baby stays warm all night. However, older babies and toddlers may find the bags constricting. These are soft pads that are tied to the sides of the cot, designed to give babies some protection from the hard sides. However, they definitely sit under the 'optional accessory' category. If you do buy one, it should carry BSI number BS 1877-10:1997.